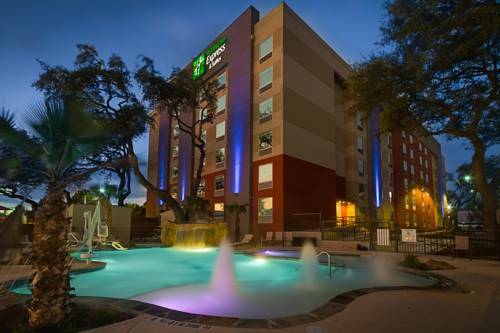 Stay at one of the Newest Holiday Inn Express & Suites Medical Ctr North in San Antonio, TX. Located off Interstate 10 and just 20 minutes from downtown San Antonio, Texas, our hotel's location and extra amenities combine to create an unforgettable stay for our guests. Holiday Inn Express & Suites Medical Ctr North is situated near businesses and attractions. Corporate guests appreciate convenient access to USAA, Valero Corporate HQ, San Antonio Medical Center, FBI building. In addition you will enjoy access to our 24-hour Business Center with free high-speed Internet and hot complimentary Express Start breakfast bar. Our quick access to the University of San Antonio Texas makes it easy to cheer on the Texas Roadrunners at sporting events. Plus, we are just minutes away from the iconic River Walk and historic Alamo. Or shop until you drop at the famous La Cantera Mall. Nearby attractions include Six Flags Fiesta Texas amusement park, the historic Alamo landmark and museum, the Alamodome multipurpose facility, AT & T Center, the San Antonio Zoo and Aquarium, the San Antonio Botanical Garden and the McNay Art Museum and SeaWorld Marine Park. The nearby San Antonio River Walk is one of the city's most popular destinations and features numerous sidewalk eateries, pubs and live entertainment. We are centrally located to all areas of San Antonio, TX, so you will always stay smart when you stay with us! over 1400 sq ft of space, with 15ft ceiling, wet bar and adequate counter space with cabinets. Projector screen with projector unit in the ceiling, wireless and wired internet. "Largest underground attraction in Texas" -- commercial cave with nice formations, hidden passages tour, and a topside dinosaur photo op. Multiple tour packages offered, inc. summer Bracken Cave Bat Flight. ~18 miles from San Antonio. Faithful, roughly three-quarter-size, replica of the Druid original in England. Moved to Ingram from the neighboring town of Hunt in 2011. ~54 miles from San Antonio.